Whether you’re looking to move something small or big most likely it’ll need to be packed. You can obviously do your own packing, and simply hire movers to do the physical labor, but if you’re unsure about where to start and packing seems to be an overwhelming task you can always entrust it to us and we’ll professionally pack your items for you. Since it’s what we do daily we know how everything should be packed in order to make the move smooth, fast and easy. Proper packing will also make it easier to load, carry, move and unload. Marking and labeling boxes will save plenty of time later on when you will be unpacking. Using the right packing materials will also have a significant impact on the condition of the item once it arrives to its new destination. Since there are plenty of packing materials out there which range in price and quality knowing which one to use so that it will both get the job done and not break the bank is crucial for many people and companies. 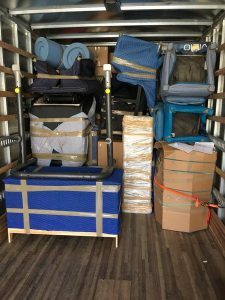 As you might be suspecting packing indeed is a very important step in making your move smooth and ensure your stuff will be transported safely and arrive undamaged. We at Easy Florida Moving LLC move people and their stuff on a daily basis and packing has become a specialty skill for us. From crating a chandelier to wrapping artworks to boxing kitchen supplies we’ve done it all and we will happily do it again!